Okay...I have a confession to make. I consider myself a romantic at heart. 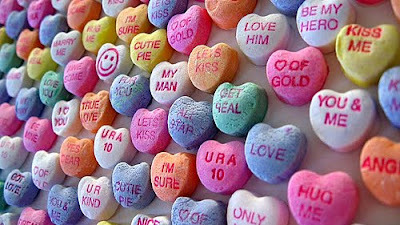 However, I have to tell you that I do not like Valentine's Day. One reason is that I believe that you shouldn't have to have a day set apart to celebrate your love for someone in some grandiose way. I believe that it should be celebrated everyday in small and simple acts of love. Second, I believe that it does more damage than good for you and/or your loved one. I think it is another way set people up for failure. Have you ever been to a store the night of February 13th? The lines are snaked all the way to the back of the store with guys who are purchasing large teddy bears, boxes of chocolates, half withered flowers, and other random gifts that they should have put more thought into before the 11th hour! This week while I was subbing at the middle school, on their "mock news" report that they have in the morning, they reported a tidbit about Korean Valentine's Day. I believe they have a better way to celebrate "LOVE" in a holiday. I came home and found a little more info on the topic and this is what I found. On February 14th, it is traditional for women to give a man that they love some chocolate, usually a piece of chocolate that is homemade. Symbolizing originality, "the only one". On March 14th, they have another holiday named "White Day". On this day, the men who received from the women reciprocate the affection offered the prior month and give back. They usually give candy as well, but the gift is usually something greater than what the girl gave him. They try to "one up" them. Following in April there is an informal holiday that is celebrated in Korea surrounding this idea of love and affection. On April 14th they have a day called "Black Day". This is a day where singles gather together and commiserate their single life by eating white Korean noodles with black bean sauce (black noodles). However you celebrate your Valentine's Day, I hope you have a good one! You are so funny, Of course I'm never at the store on the night before ANY holiday. Sounds like I'm missing out on a great laugh. It is a ridiculous holiday, but so is the super bowl. Our nation has it so darn easy, I mean why can't kids go to school on presidents day really! This holiday came and went for us - as usual. My dad did get me a rose. He always gets us something on Valentine's day. My dad is always a special "valentine". Unfortunately I bare the curse of "downsizing holidays" even the big ones. I'm hoping to get better - for the kids sake! Who do I know in Korea? Love your background. And I agree that V-Day sets people up for disappointment. Derick surprised me though and made the weekend a great one. Hope you and your kids had fun shopping!